Where do you rank among future leaders in the Baltics? for future managers and entrepreneurs and find out! RTU Riga Business School (RBS) in collaboration with SEB Bank invites high school students to be a part of an exciting week in the business world, and try out what it means to do business. The students will also be competing for a full scholarship for studies in the Riga Business School BBA program. 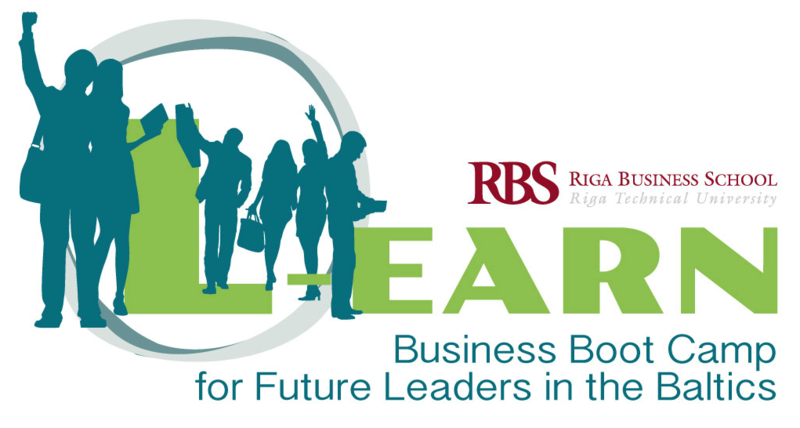 Designed specifically for high school students, Riga Business School’s L-EARN camp provides a sneak peek into the business world, decision-making and idea generation. During the camp, participants will become a part of a "management team" for a week. Their main task will be to propose a solution for a real business problem from SEB Bank. To complete the task, participants will attend lectures on different business areas and meet with representatives of SEB Bank. They will also visit other RBS Alumni companies to get a sense of what business means in real life. During the camp participants will have the support of the Camp Teaching Leader, other RBS professors, and SEB Bank employees. On top of that, they will take part in social activities with RBS students. Why participate in the LEARN? A week of training and real business experience. 7 days of sharing time and ideas with your peers. Test yourself and find out if business is the right path for you! How to become a part of LEARN? After receiving your applications, we will choose the 25 top applicants from the Baltics who have the strongest academic achievements and richest extracurricular activities. During the camp, each participant will be evaluated and student with the highest result will receive a full tuition scholarship for studies in Riga Business School BBA program. 50 EUR (room & board isn’t provided). The best option for students with friends or relatives in Riga. 150 EUR (participation & accommodation). Claudio grew up in Argentina, but he is based in Latvia since 2004. Most of his career has been developed in consulting, training and research on Leadership and Organizational Behavior at companies and organizations like Elevator International, Turiba Business School, Stockholm School of Economics in Riga, Euromonitor International, Cisco Networking Academy and IAE (the best Business School in Latin America) Claudio has a long track of experience in consulting at the IT, NGOs and HR sectors. He teaches in English, Spanish and Latvian and has been training people in more than 10 countries and from more than 30 nationalities. Claudio has been appointed visiting lecturer for FEN (Poland) for the courses on Leadership and Human Resources run in cooperation with IESE (www.iese.edu), one of the best business schools in Europe. As researcher he has been publishing in several journals and conference proceedings, and he has participated in several international research projects. Overall, Claudio has been extensively involved in professional and higher education. Currently he is one of the leading consultants at MODES project, one of the largest co-funded EU initiatives for modernizing higher education in Europe. Claudio shares his professional career with a broad range of social undertakings in areas connected with education and promotion of family values. Randev Dias is an internationally experienced Business Professional specializing in IT, Project Management, and Organization Strategy. With over 10 years field expertise, Randev focuses on how to effectively apply theoretical concepts in a business setting, thereby defining strategies for IT innovation and business growth. In academics, Randev focuses on engaging the audience by analyzing real-time case studies and examining the underlying concepts, thereby making the courses applicable and relevant. Through facilitating active discussions and group work, the objective is to ensure that students understand the core concepts and their applications in the Business/ IT. In addition, Randev is an author of the book "Outstanding Outsourcing" which describes emerging trends and strategies in business process outsourcing.